Power shunts are large cross-sectional area copper braided connectors, used as an alternative to power cable and solid busbar, designed to meet the current carrying capacity of power distribution applications – designed with multi-layers of flat or round copper earth braids to achieve sizes up to 500sqmm and carry currents in excess of 1100 amps. Power shunts are used as an alternative to solid busbars and power cable assemblies capable of carrying very high currents yet are flexible, robust and easy to install. Typical power shunt applications : power stations, transformers, motors, generators, switchgear, substations – low, medium and high voltage including 11kV 33kV switchgear and power systems. Shunt connectors are used to provide LV MV HV transformer-busduct links and undrilled palms can be customised to suit customer requirements. 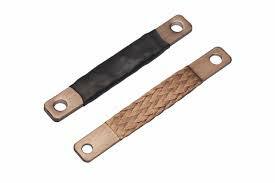 Multiple layers of flat copper braid are used and assembled in a parallel or stacked format to achieve the required cross sectional area or agreed current density. In certain circumstances flexible strand is a practical alternative. The power shunts are used to provide interconnects for low voltage LV power distribution units and machine connections in both indoor and outdoor locations – stainless steel braids can be used for enhanced abrasion, corrosion, chemical and UV resistance. Thorne & Derrick International are established distributors of an extensive range of large braid connectors, also known as “Power Shunt” connectors with cross-sectional areas of up to 1000sqmm and current carrying capacities in excess of 1800amps – larger style earth braid power connectors are designed for heavy-duty power applications as flexible current carrying connectors requiring resistance to vibration. Robust, durable and flexible power shunt braided connectors are specified for power distribution in turbines, HV substations, power stations, distribution grids, electrified trains and rail systems as alternatives to solid bus bars. 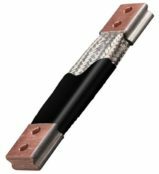 Manufactured from bare copper, tin-plated copper or stainless steel, shunt style braid connectors can be supplied with or without polymeric insulation for mechanical protection and electrical insulation and with customised “palm” style terminals. Flexible copper connector power shunts can be insulated using protective heat shrink sleeving for identification. 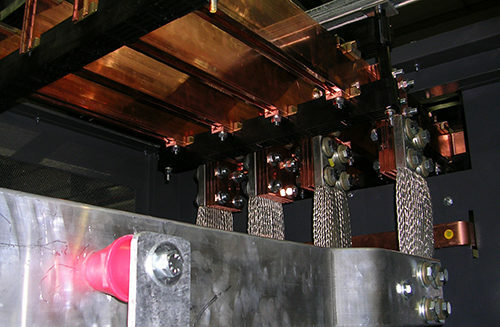 Copper braid power shunts can be made to custom lengths, widths. thicknesses and drilled hole arrangements – flat or tubular shaped designs can be configured with options of soldered studs or crimped cable lugs.